Do you believe in magic? Do you think a witch could change your luck and help you win some serious money? 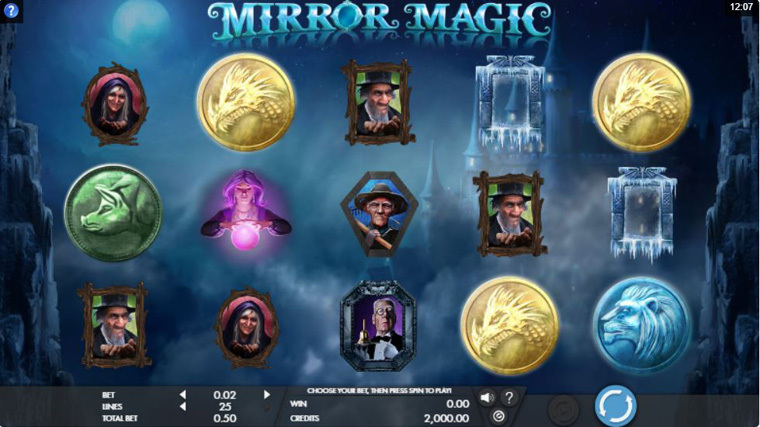 Then Mirror Magic is an online video slot which was made especially for you. From the brilliant software providers from Microgaming, we give you a 5 reels, three rows and 25 paylines online slot that has a magical twist to it. The graphics and sound effects are just amazing, but the storyline and the bonus features which are available take this slot game to the very next level, making it one of the most beautiful games you could play. Wild – the joker is the wild and except for the scatter it will substitute every symbol and help you land winning combinations. Scatter – the purple-haired witch with a crystal ball is the scatter and the most interesting symbol of the game. She pays in any position and the scatter wins are multiplied by your total wager. When you land three scatters at the same time you will trigger the bonus game. Mirrored pays free spins – When 3, 4 or 5 scatters are on the reels at the same time you will trigger the mirrored free spins. Here you will get 10, 15 or 20 free spins where you have a new paytable. All the character symbols will turn from beggars into royalty and pay out more. The extraordinary theme and graphics, paired with a 97.17% RTP will make this game one of your favourites!